With winter rains bringing yet another dreary weekend to the Baltimore area, many Marylanders are wistfully pondering escapes to sunnier climes. One popular way of getting there is the time-tested recreational vehicle or RV. From small, simple, tow-along trailers – to well-appointed motorhomes, RVs have become the go-to option for millions of Americans seeking a secure and leisurely travel experience. 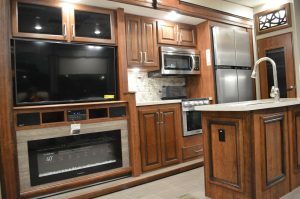 This weekend, travel pros from across the Mid-Atlantic region and beyond are exhibiting the best the industry has to offer at the 2018 Maryland RV Show. The expansive show wraps up this Sunday at the Maryland State Fairgrounds in Timonium. 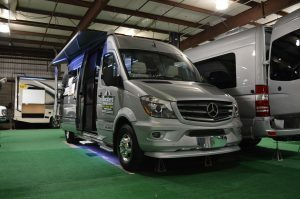 Filling three exhibition halls are the newest motorhomes (Class “A” through Class “C”, mini low profile van campers and conversion vans), along with conventional travel trailers, fifth wheel models, toy haulers, and tent campers. Also on hand are dozens of vendors with unique add-ons and camp site reps with information about thousands of fascinating destinations. An Airstream is also on site, though it must be noted the gleaming model on the showroom floor is of the mid-sized Touring Coach variety, not the ubiquitous travel trailer. Scott West – product manager for the Light and Ultra-Lite products division of Highland Ridge RV in Shipshewana, Indiana – said the lines he represents are designed around half-ton pickup trucks and full-size SUVs. “We concentrate on family floor plans with bunks and an assortment of sleeping positions. Price-wise, we’re the low twenties – mid-forty thousand dollar range. Given the hefty investment of what are primarily purely pleasure vehicles, we asked Scott who is doing the buying? “Millenials are our fastest growing demographic right now. On the weekends, they want to get out, unplug and unwind. We’re seeing a lot of younger families starting to enter the RV market. In my particular market, sales are up around 12-13%. As a company, we are up about 20%. We’ve been in business for a decade now, and we have grown every year. Scott told us that the licensing to drive or transport an RV varies state-by-state, but for the most part, any one in Maryland with a valid Class D license is good to go. We asked Scott what’s the number one question he is asked by first-time buyers? 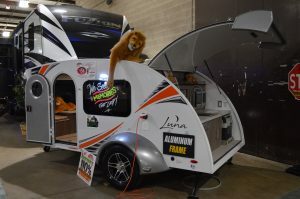 Greg Merkel – owner of Leo’s Vacation Center in Gambrills, Maryland – got his start in the RV industry at the age of 14, when his parents launched the family business in 1972. Over the years, he has done everything from servicing RVs, to retailing and rentals. We asked him how the industry has changed in the last 50 years? What about changes in the trailers and motor homes since the 1970s? What is the life-expectancy of an RV? Greg said his business offers a complete line of sales and service options. What advice does he give first-time buyers? Navigating the exhibition halls on a Friday afternoon, we spied a few families with children but didn’t encounter any potential first-time buyers. 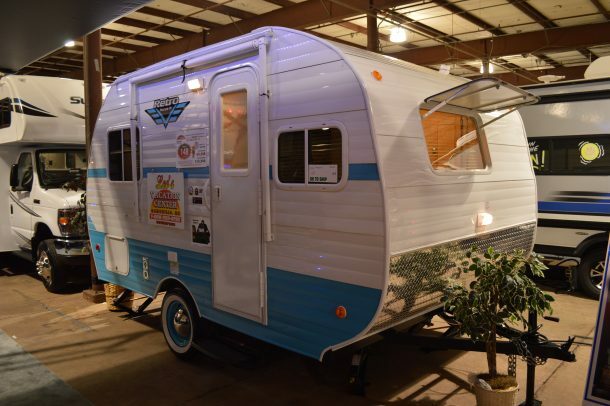 We did however speak with two couples who were seriously perusing the current crop of RVs. 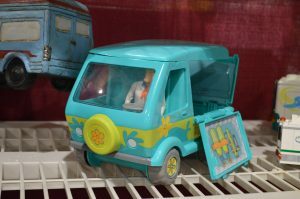 “I was kicking around the idea of toy hauling, but they don’t make too many of them in a Class ‘A’ RV,” said Severn resident Robert, who along with his wife Patty, took a moment to explore a few high-end models. Robert said the high-end RVs on display were more than he and his family would ever need. “A lot of these are for glamping, and I understand that everybody has their own motive for making a purchase. But we still work. We just want something with a comfortable bed, a bathroom and a kitchen. Patty noted that one of the things she has come to enjoy is the extended RV family. Jim Ammons – a recently retired law enforcement officer – currently owns a fourteen-foot camper. Jim said the nicest thing about owning a camping trailer is the ease of travel. What’s the best thing about the RV lifestyle? 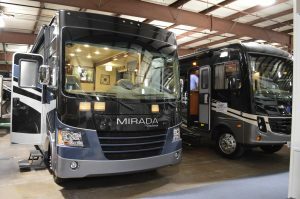 The Maryland RV Show runs through tomorrow, Sunday February 25, at the Maryland State Fairgrounds, 2200 York Road in Timonium. Tickets are $10 for adults and children under 12 may enter for free. More information is available online or by phone at 443-356-5857.